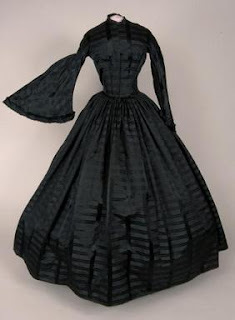 Today’s dressgasm of the day is a black silk taffeta dress from the mid-nineteenth century, most likely the late 1850s into the early 1860s. This dress has a lower waist than the mid-1860s dresses, which were cut above the natural waistline, so I’m inclined to think this dress was either made before the Civil War or altered after the war to reflect the return to a natural waistline. If it was altered after the war, however, I feel that the women would have changed the outdated pagoda sleeves to reflect the more modern form fitting sleeves. 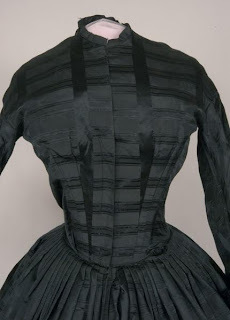 The silk taffeta itself is unique and gorgeous with alternating light and dark stripes created by switching the direction of the weave in the silk. That is my best estimate from seeing other silk taffeta dresses made in a similar fashion. It may also be achieved by adding wool into the weave to make it darker. There were a lot of tricks back then to create illusions with different types of fabric getting woven together. I believe that this dress was used for mourning. The lack of embellishment on the dress itself suggests the simplistic look that someone in the deepest stage of mourning was supposed to display. A widow, for example, typically went through different stages of mourning for about two years before she could fully rejoin society again. The stages of mourning ranged from solid black and seclusion to wearing purple and slowly rejoining society in the later stages. It is a common misconception that people never wore black unless they were in mourning. On the contrary, black was a fashionable color. What made a black dress a mourning dress was how it was worn. There would have been black edging on the collars and undersleeves, or they would have been totally black. Jewelry would have been kept simple and made of materials like jet or hair from the recently departed. A simple black bonnet with a heavy long black veil hid the widow from people if she was to be seen anywhere in public. Women were not allowed to attend social functions in the earliest stage of mourning if they could possibly avoid it. If she went to a wedding, she would have stayed in the back of the church separated from the congregation as to not cast a dark shadow over the joyous day. Men, on the other hand, generally only mourned for six months before it was acceptable for them to remarry. It seems a little unfair, right? Children were not exempt from mourning rituals either. They typically wore white gowns with purple and black accents.